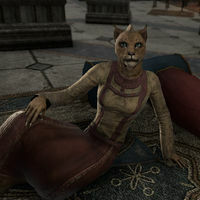 Aznara is a Khajiit commoner who sits inside Headman Bhosek's Palace in Port Hunding. When you speak to her, she comments, "You do not carry yourself like a servant. Best see to that, if you wish to avoid a beating." This page was last modified on 22 October 2017, at 18:13.